Today I’m trying to strike the right balance of positivity and honesty when I talk about this quilt. I want this blog to be a fun place to spend a little of your precious time escaping from whatever it is that you are taking a break from. But I also want it to be a safe place where I can tell you honestly how I feel about my projects so we can learn together and improve together. So I’m going to be honest and tell you that I don’t love this quilt. I’m not upset about it. I definitely like it. It’s definitely pretty. But I want to learn from this experience and figure out why I don’t love it. I knew long before I finished it that it wasn’t going to be a favorite. It was still important to me to finish. I try to finish all my projects because I know the end product will always be useful. And I don’t want the ghosts of unfinished projects to haunt me when I start something new. I like to approach my new projects with the confidence that comes from knowing it will get finished and someone will use it. As I’ve worked on this, I’ve tried to think about what it is exactly that went wrong. It’s not the simplicity of the patchwork. I love square patchwork. It’s what drew me to quilting in the first place. Go ahead. Tell me what you do or don’t love about this quilt. It’s ok to love it. It’s ok not to. Either way I want you to think about why so you and I can both benefit from it. I hope to be back for work in progress Wednesday next week with my first gypsy wife blocks! I feel fairly confident that I am going to love those. Linking up with Crazy Mom! This entry was posted in Uncategorized and tagged Fabric selection, Finished Quilts. Bookmark the permalink. It needs different quilting. With the large 5 inch squares, the quilting should be denser. Love to see in quilted in an all over feathers pattern. I like it. I agree that it could perhaps use more quilting. 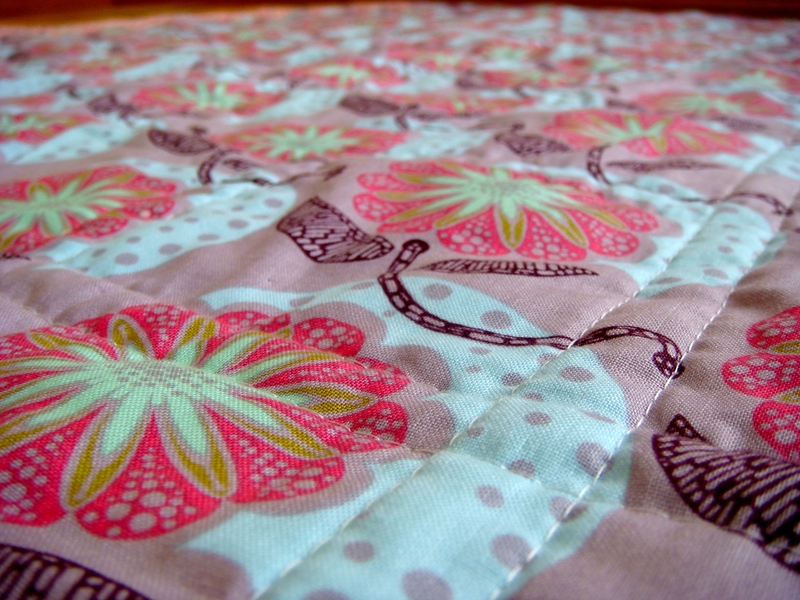 I am enjoying the use of perle cotton big stitch hand quilting on some of my quilts. That would be a fun touch you could still add. I LOVE it!! Seriously do. I love the color choices and fabrics you picked! The purples are gorgeous & the blues & nuetrals you put with them go great! I Love this quilt & the quilting. I love the simplicity of it!!! This isn’t my favorite of your quilts, though I think it’s perfectly fine. I think it would have benefitted from some heavier quilting that had some movement to it–some curves. This just falls a little flat. Time to face free motion quilting and make it your b—-! Ok, so I am not an expert in any way at all! I’ve made three quilts now. I was taught in a class to look at your quilt and squint your eyes. If it blends well and is appealing, then it’s good. I don’t always let this stop me from doing what I want, but I have learned from that! When I first looked at this quilt, I thought it’s “just ok”. I squinted and saw no movement. I think that’s what’s missing. 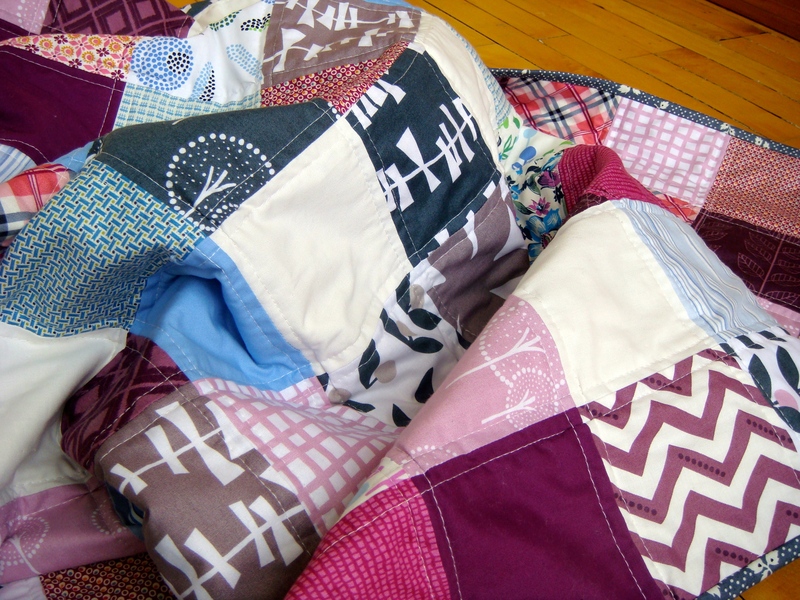 I think that all the straight lines of the squares, and the quilting, are what makes this quilt motionless. I’m no expert, but maybe if the quilting of this quilt would have been curvier, it would have brought the movement into the quilt that I don’t see. Now, having said that, I’m also not a fan of the colors, but that’s my opinion. I love colors in quilts that make me happy. 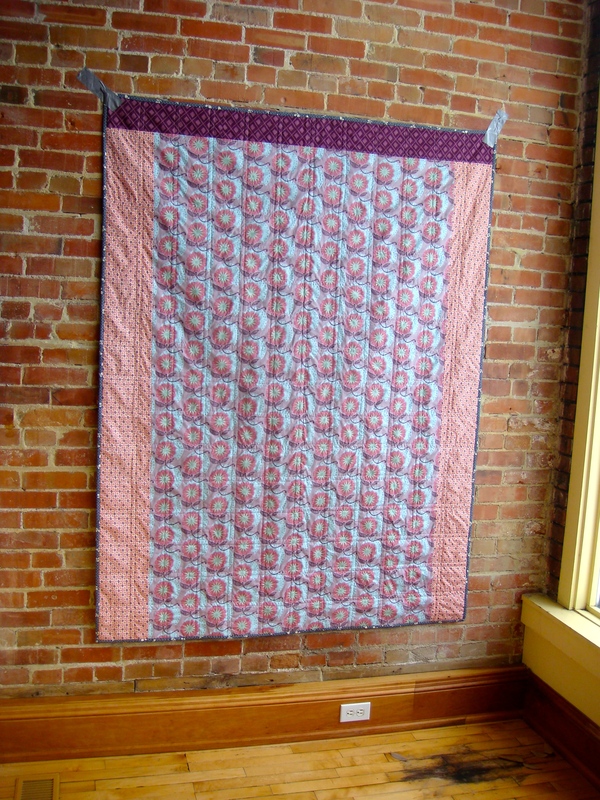 When I saw this quilt, I thought, ewe, yuk, don’t like this. It’s boring. But I do appreciate quilts with these darker values. I’m just not a fan of working with those colors in quilts. I just tend to buy brighter value fabrics. Again, not an expert, in any way at all, just my thoughts. I also want to say, please don’t take my thoughts as criticism. They are my thoughts I’m sharing with you. I’m not trying to hurt your feelings in any way at all. I LOVE your work, have done my very first quilt-a-long with you Sarah and I really loved how my quilt turned out because of your design. 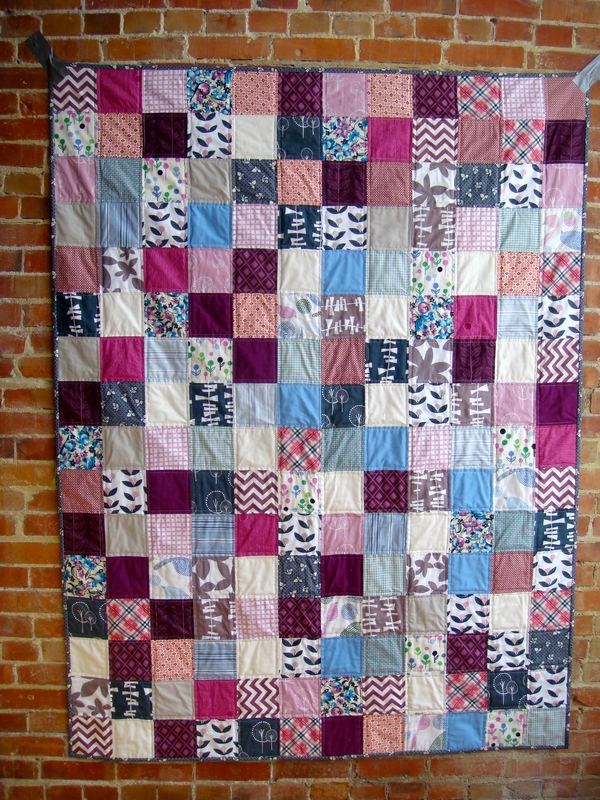 I used my most favorite fabric for that quilt and I am so happy it turned out so fantastic! It was my 3rd quilt that I made, btw, & I still need to quilt it, so it’s technically not yet a quilt! For me, I love using 5″ squares for simple patchwork. Heck, sometimes I even use 6.5″ squares – although when I go that big, I useally throw in a few 4-patches made with 3.5″ squares for variety. 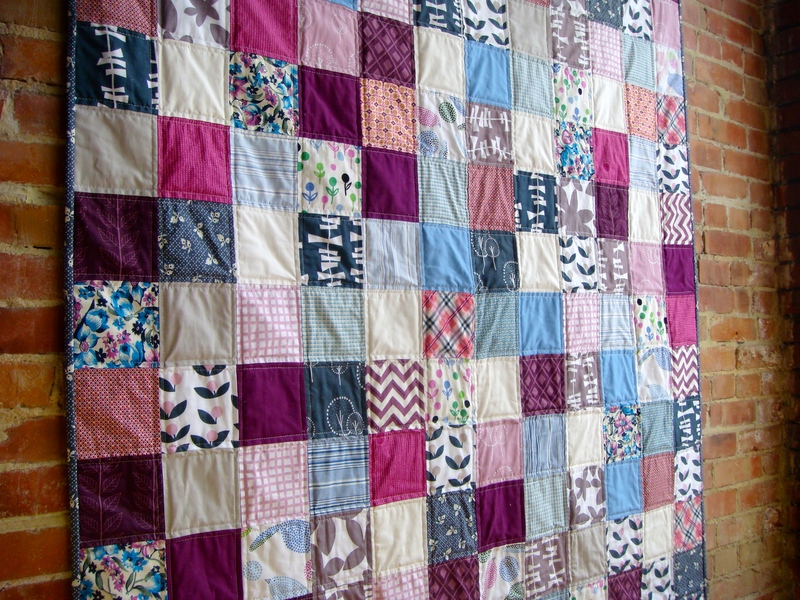 Looking at your quilt, I would say I would prefer a greater variety in color, or an added border. Just my two cents 🙂 I’m sure someone will love it though, and it will be happily useful, too! I love it! The pops of fuchsia are fantastic. Love everything about it. It’s simple, inviting and gives me a prairie like feeling, a tranquility of sorts.